Thu., July 26, 2018, 5:13 p.m.
FLOWERY BRANCH, Ga. – Falcons coach Dan Quinn had good reason not to worry about Julio Jones showing up for training camp. Jones told Quinn weeks ago he’d report on time, even as the wide receiver sought to have his contract renegotiated. A training camp holdout appeared to be Jones’ best path to a new deal. Finally, the Falcons announced close to midnight on Wednesday they’d reached an agreement to renegotiate Jones’ deal next year. The news came about 16 hours before Thursday’s deadline for players to report. The Falcons announced Jones reported before Thursday’s 4 p.m. deadline. Quinn said he spoke with Jones earlier this month when the receiver participated in an annual offseason passing camp in California led by quarterback Matt Ryan. “It was probably during that time that I felt comfortable he was coming to camp,” Quinn said. The reassurance from Jones was especially important after he did not participate in the Falcons’ mandatory minicamp in June. Quinn and general manager Thomas Dimitroff were in good spirits as they discussed how they avoided the potential distraction of a training camp holdout by one of the team’s most prominent players. It has been a good week for the Falcons’ leadership team. Quinn and Dimitroff have new three-year contract extensions, which were announced on Wednesday. Jones, a two-time All-Pro and five-time Pro Bowl selection, wasn’t happy that a flurry of new contracts signed by other top NFL wide receivers moved him down the list of top-paid players at the position. He is entering the third year of his five-year, $71.5 million contract, including $47 million in guaranteed money. The Falcons managed to make Jones happy with an undisclosed financial “adjustment” without a dramatic change to their salary cap position for 2018. Dimitroff wouldn’t reveal details of the new agreement. The biggest reward for Jones was the assurance the team will rework his contract following the season. That promise was delivered with more than a handshake. “Papers are written up, sitting on a desk waiting to be signed,” Dimitroff said. 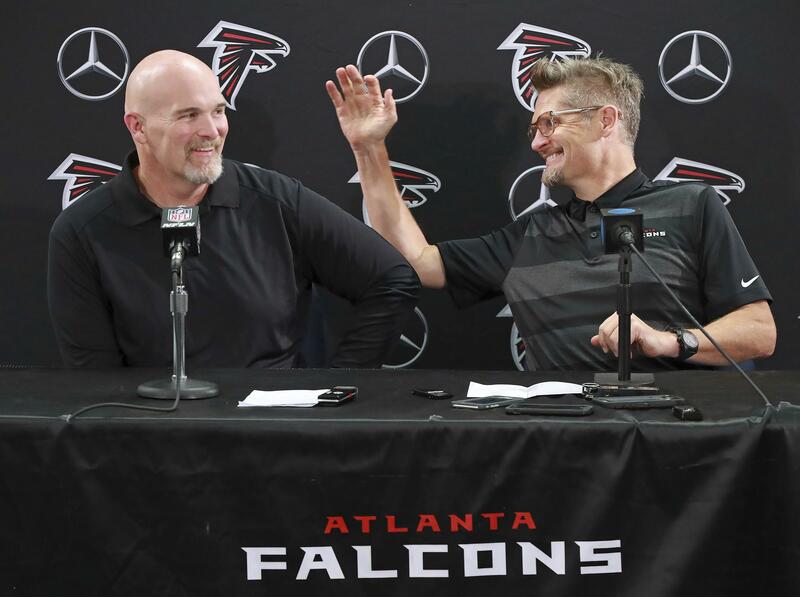 The agreement preserves Dimitroff’s flexibility in his efforts to negotiate contract extensions for defensive tackle Grady Jarrett, offensive guard Jake Matthews and safety Ricardo Allen. The Falcons already agreed to a five-year, $150 million extension with quarterback Matt Ryan, the most lucrative deal in NFL history, this offseason. Ryan’s contract and talks with players moving closer to free agency left little financial space to make big changes to Jones’ deal before 2019. Jones is expected to talk with reporters on Friday, when the Falcons have their first practice of training camp. He was not seen during the 30-minute period reporters were able to view players reporting to the team’s practice facility. Jones’ teammates seemed to have little concern about the status of the team’s top receiver. Poole said players don’t get involved in teammates’ contract talks. “When it comes to that kind of stuff, everybody kind of worries about himself,” Poole said. But when it comes to Quinn and Dimitroff, having one of the league’s top receivers on the practice field is crucial to the team’s hopes for a third straight playoff appearance. “I sleep a hell of a lot better at night,” Quinn said. Published: July 26, 2018, 5:13 p.m.